Byworth Boilers has improved boiler control and overall system efficiency by using the VSD’s loop control built into ABB’s machinery drive. The controller quickly responds to changes in demand for steam by accurately adjusting the water feed pump within its boilers. PID (proportional–integral–derivative control) is a control loop feedback mechanism widely used in industrial control systems. Markedly, it regulates flow, temperature, pressure, level, and many other industrial process variables requiring continuously modulated control. An algorithm continuously calculates an error value from the difference between the desired setpoint and a measured process variable. A correction based on the PID automatically applies a correction to the output. In an everyday example, a car’s cruise control automatically compensates to maintain speed when going up and down hills. Here, the PID algorithm constantly corrects the current speed to the set speed without delay or overshoot. It does this by controlling the power output of the car’s engine. An industrial boiler needs to provide a constant flow of feed water to its heat exchanger. At the same time, steam is often tapped to meet the demand for process steam in some applications. This causes the temperature, pressure and flow rates of water and steam to constantly change. Yet in some applications, particularly in food production, a stable water level is critical for boiler efficiency and the process. Working alongside the ABB authorised value provider, Byworth’s control system engineer Jason Atkinson worked to provide a solution. He identified the VSD’s built-in PID loop control as a way of stabilising the water and steam flows. The PID control measures the system’s water and steam temperature, flow and pressure. It then calculates the optimum speed at which the pump’s motor should operate for the best boiler water flow rate. It then adjusts the flow rate to maximise the efficiency of the complete boiler system. As the demand for steam varies in the process over time, the PID controller alters the supply rate of the water entering the boiler. This ensures the boiler uses the correct amount of energy producing hot water to match the process demand. Maintaining a stable water level reduces cold water intake and provides a more consistent steam supply. The VSD’s loop control works by maintaining pressure behind a feed water valve based on feedback from a pressure transmitter. It also takes feedback from the boiler water level measuring instrument, typically a guided wave radar. 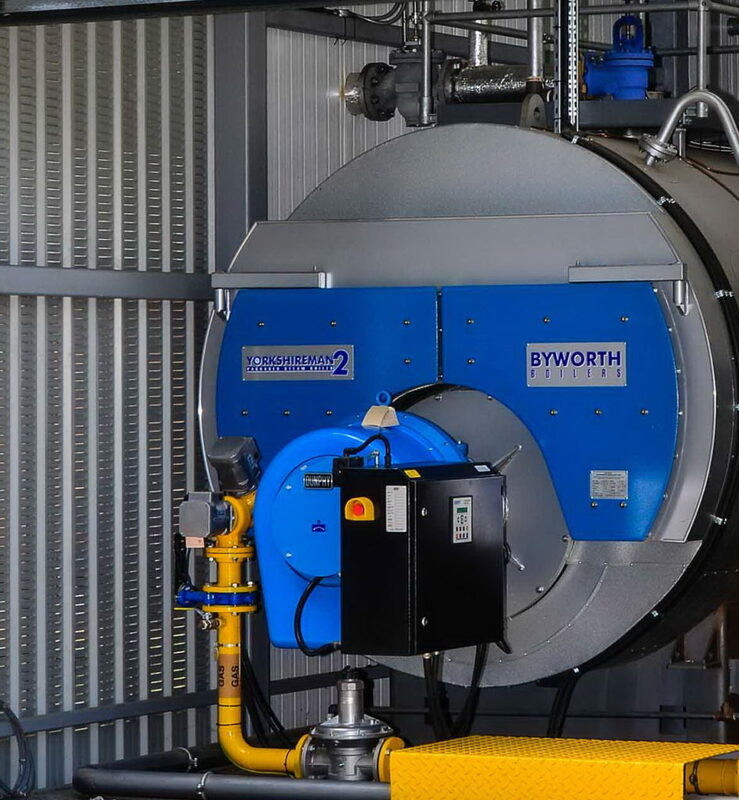 Byworth Boilers manufacture steam, hot water and waste heat boilers, with capacities ranging from 250 to 18,000 kg/hr. Each boiler is fitted with an ABB machinery drive, ranging from 1.1 kW to 20 kW, dependent on the boiler flow rate. Byworth Boilers, based in Keighley, West Yorkshire is one of Europe’s leading manufacturers of industrial boilers. They produce up to 100 boilers a year for use in breweries, distilleries, healthcare and also petrochemicals.